But all that is beside the point. As the brave and noble screwdriver, it is your duty to solve the problems in the land, not sit around contemplating the oddness of it. And, this is a good thing too, because as a screwdriver, you are noticeably lacking a mind with which to think. To progress the story, you will need to figure out what is supposed to be what (with a few hints), and then make ridiculous combinations to solve outlandish puzzles. 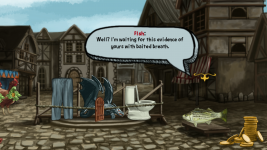 But, if you've played a point & click adventure before, you have probably already done something similar. 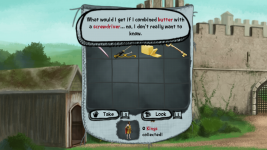 The random objects also allow for some great (and terrible) puns that will appear in different playthroughs based on what objects are swapped with what! 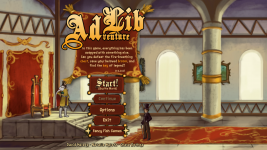 ADventure lib is a relatively short game that we made as an experiment/side project. It is close to done, with the only major feature missing right now being voice acting. Yes, I will be adding voice acting to the game, as it is too funny not to. It will be handled like those automated voice tellers, where the swapable words will be inserted cookie-cutter style. The game is also designed to be very mod-able, so if you want to add your own objects, translations, or even entire scenes/dialogue/events, that is all doable without a line of code (just mucking about some XML files). If you're interested in learning more, just leave a comment or send me a message!